It’s been a while since I wrote my piece for F-Stop Gear and I have been meaning to get it up in a blog post. With summer coming to a grinding halt I am able to spend more time typing than shooting so here goes. During the initial phase of planning a trip I always have to consider the balance of walking away with compelling images as well as the climbing aspirations set out by the group. Being able to keep pace with a rhythm that finds me shooting landscapes during the early hours of the mornings’ calm stillness and then quickly transitioning to the chaos of climbing is always a challenge. Being that Jasper National Park is in my backyard, I am lucky enough to be able to plan where the light will fall based on my past experiences. Sitting alone in the calmness of the morning with the ancient Rocky Mountains towering overhead is a feeling I will never be able to fully explain. There is a sense of reverence that washes over me as I try my best to capture these amazing giants. I sit and wait for the light to come, anticipating, considering drama within composition and allowing my creative subconscious to take over. As the golden light becomes a bluebird day, I head back to the truck, feeling both happy with the morning outing and excited for the afternoon of ice climbing in the canyon. Athabasca falls with the XT-2 & the 10-24. We decide to try and find some good ice at a local spot, the beautifully sculpted Maligne Canyon, where the climbing is laid back but always full of adventure. As we meander our way up the ancient canyon, we test the ice, crawl under massive log jams, and eventually find a beautiful pitch of ice to climb. It always amazes me the contrast in the style of shooting that comes with going from landscapes to adventure photography; with landscapes you set up and enjoy the light but with something like climbing the camera always has to be at the ready because you never really know what the changing environment will demand. I felt very pleased with the images that came from the moments between the climbing, mostly because they tell the story of the adventure to get to the ice and it’s these moments - the in between adventures - that truly made this day memorable. The Queen, an stunningly aesthetic pitch of ice in Maligne Canyon. Hiking out of the canyon that day, I reflected on how it really never is about the climbing - it’s about getting out and adventuring. 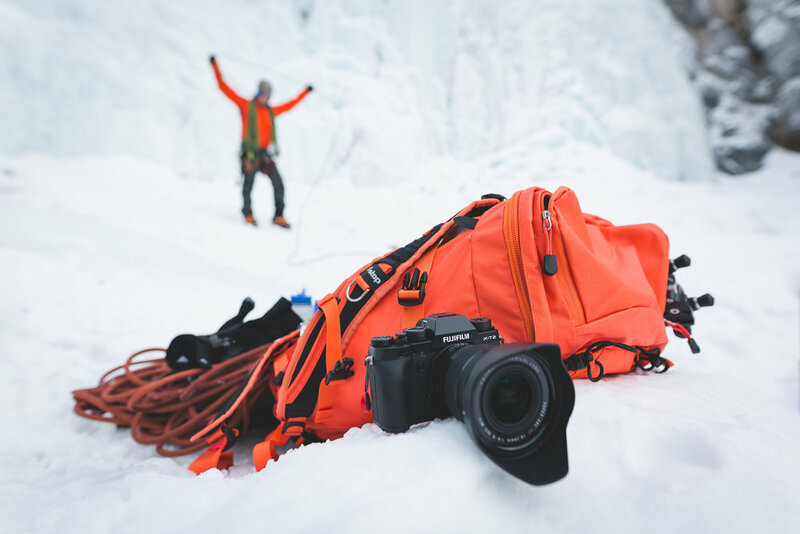 Whether we climb hard routes or just meander our way up a frozen canyon, my soul is happy taking pictures of both - whatever the day unfolds to be. The most epic log jam ever! As the light fades from the day, my last objective of the trip was to get to Sunwapta Falls, a hotspot for any photographer passing through the Canadian Rockies. We head in the exact opposite direction of the canyon we just climbed and prepare to change gears once again - leaving the chaos behind and returning again to the calm of capturing a landscape. Sunwapta Falls demanded a fresh perspective, so upon my arrival, I set out to capture their beauty in a new an unseen way. I set up for this unique shot, calculating, planning for the best use of fading light and I click the shutter. I am happy I chose this new perspective, because I ended up with a new portfolio image I am really proud of. I love that when people see the image they have to take a second glance to realize it’s the famous Sunwapta Falls. The last rays of light descend behind the great Rockies and I am left with a heart full of gratitude to have gotten out and done what I love all in the span of one day. The images are what we get out for, but truthfully, it is the soul medicine we seek of a good day out. A unique perspective of Sunwapta Falls.